The Jarvis Model 425-20 – hydraulically powered hock cutter for sheep. • The 425-20 is best suited for sheep hock cutting before fleece removal. It is also suitable for beef tail removal and hog hock cutting. 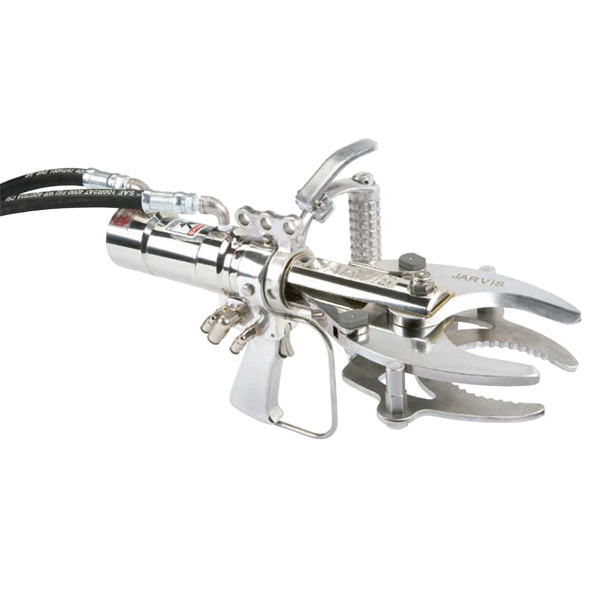 • Specially designed grabber mechanism holds onto hock to prevent dropping until a trigger is released. • Compact for easy maneuverability; robust for long, trouble-free operation. • Super fast cutting cycle combined with high cutting force means high performance for the most demanding applications. • Designed for optimum operator comfort. • Anti-tie down controls for operator safety. • Constructed from corrosion resistant materials for optimum hygiene. • Meets national and international requirements for hygiene and safety.